This project has run for a year and aims to help non or poor readers to read. 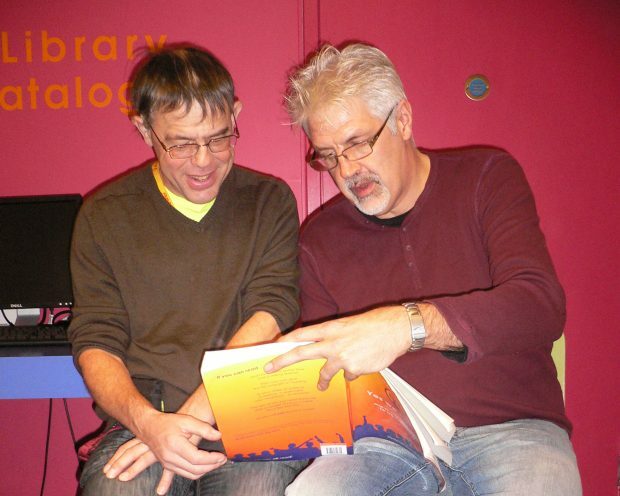 Volunteers support readers to develop their reading skills in one-to-one coaching sessions in libraries. It is based on the premise that anyone who can read fluently can teach a poor or non-reader to read in 6 months or less using the “Yes We Can Read” book, a one-to-one phonics based workbook. The project’s work is now continuing as business as usual across all 47 of Norfolk’s libraries and 8 mobile libraries. Note: Full Fact (the independent fact checking charity) states that about 5 million working age adults have 'below-functional' literacy skills in England. X was street homeless until recently when he was allocated a place in a Norwich hostel. Although glad to be off the streets, he hates hostel life and is determined to get a job and a place of his own. He felt that improving his reading could help with this. He turns up at the Norfolk and Norwich Millennium Library every week and is doing really well. At a review meeting this week he said, ‘Being part of this has made me even more determined to get my life back on track and get out of the hostel – it’s given me a sense of purpose’. X also joined the Reading Ahead scheme and is already 2 books in! A learner who couldn’t read at all when referred 6 months ago says: ‘I have always wanted to be able to read (without being made to feel stupid) and this project is giving me that - and will also give me the opportunity to do/be the things I have always wanted to be’. Personal approach is great and I feel like I’ve made a friend in my reading coach’. ‘I was lucky with my coach and think we were a good match. He was patient and supported me a lot. I am now able to read better/more fluently which will help my job prospects. I’m now also borrowing and reading books and excited about what I’m reading’. Reading for leisure and pleasure is an important goal for our learners in this programme. Just the act of reading a whole book has been a first for participants and a source of great pride. The library service has invested in Yes We Can Read readers, Quick Reads, the Reading Ahead scheme and book stock for emergent readers to help people grow confident as they progress on their reading journey. Important partners have been Job Centres. Feedback from a member of staff at the Norwich Job Centre about a learner was: ‘She is currently working on the Dyslexic Workbook with her reading supporter and is feeling much more confident than she has ever done as she understands why she’s been having this problem all her life and she’s not stupid. At her last appointment she was able to read a poster at her work coach’s desk which is such a huge significant step and opening her eyes to the world. She’s now able to follow what her young grandson is reading when she’s listening to him. This ladies’ life has been changed by Norfolk Reading Pathway’. We have also worked with schools – the ultimate aim being to encourage children to learn to read and use their local library. 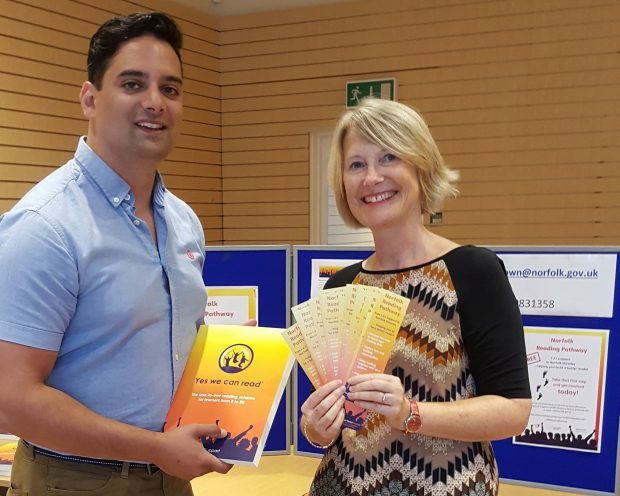 Gatehouse Publishing who publish the Yes We Can Read phonic workbooks have played a really positive role in the project by supplying the phonics workbooks at a generous discount and also supplying free overlay rulers which help people with dyslexia to read. They have also provided free art work and bookmarks advertising the service and are continuing to support our work. ‘The Yes We Can Read model, in which volunteers teach reading one-to-one, has been successfully implemented on localised projects for several years. We know it works! 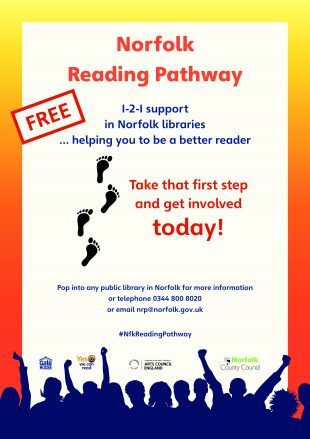 Norfolk Reading Pathway is the first county-wide, cross-organisation implementation. Having initially trialled the programme with just 6 Yes We Can Read coach and learner pairings, Norfolk County Council Library and Information Service were confident that they had proof of concept for a wider roll-out. Huge credit must be given to Jan Holden, Sarah Hassan and the team for their energy and enthusiasm in engaging with and enthusing partner organisations and residents across the county. We learned along the way that we were not able to support people who speak other languages as they need different help, so we seek to support them in other ways such as participation in library “English Exchange” groups and referral to other partners and agencies. learning to read genuinely changes your life. Full stop. We have been lucky in having two excellent Literacy Coordinators, Christian Brown and Angela Jefford who worked tirelessly to draw people into the project and keep them on board and were really passionate about their work. 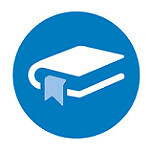 The Reading Agency has published research into the effects of reading for pleasure and empowerment and proved the links to enjoyment, relaxation and escapism, increasing understanding of self and social identities, empathy, and knowledge of other cultures, relatedness, community cohesion and increasing social capital. These positive life outcomes are concerns across the board for the council so this project has got us noticed and we have been asked to contribute to writing a literacy strategy for the whole of Norfolk County Council. Going forward we have developed a role of “Volunteer team leader”. This person will manage teams of volunteers in small clusters, locally. Library managers and Volunteer team leaders will match readers and volunteers and provide a supportive and welcoming environment. Hmm. I was, at first, positive and impressed by this concept. I like the idea of a library service and librarians promoting a volunteer reading scheme. But then I read further and discovered that the model was a Behaviourist 1:1 teaching of phonics skills. No. Phonics help with reading, but are not key. Reading is key to reading. The more access to good books is supported by volunteers the better the readers will do. Supporting the struggling readers with the books they can read, identifying appropriate books ( very much part of the librarian's skill set ). That's the way forward and what I'd want to see from a librarian lead, rather than teacher lead, approach. Couldn't agree more with above comment. Particularly that phonics help with reading but are not key. Not all adults who are struggling readers are dyslexic. Incredible as it may seem, many went through an education system where some schools failed to prioritise learning to read as an outcome for all. As a result many children fell behind in their primary schools, lost confidence and gave up. The emphasis on good phonics teaching in the early years is very welcome. This can be done in a thorough but fun way when children are young. However, some children will still slip through the net and Norfolk Education should be aware of this. Learning to read involves using a variety of cues including visual, meaning and syntax. Above all, they should "get" the pleasure of reading. It is also crucial that they have access to a progression of texts that provide just the right level of difficulty to match their reading skills. These texts should also be interesting to the reader! How often I have listened to children read who have been taught to read phonetically. They sound like expressionless robots and show little interest in what they are reading. The same methods of learning to read must also apply to adults. What they are given in the above scheme is indeed just a "behaviourist" method.